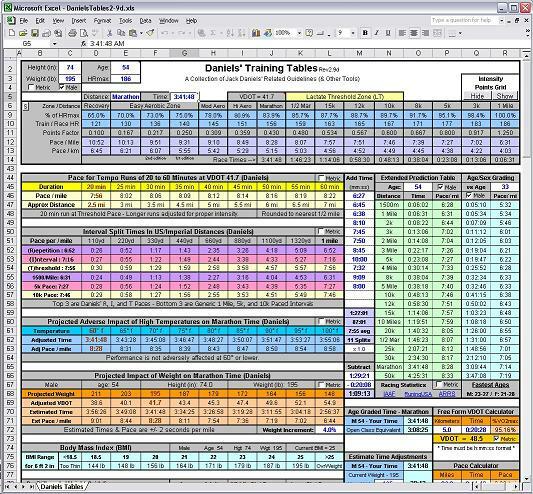 Building a Training Plan: Doing it by the book(s) by Mick Wall. Published October 2015. Note: some of the information in this document has been updated or superseded within a new document; Train Smart, Have a Plan! So be sure to check that out too. At first I started out jotting down training notes for my own benefit on scraps of paper. Much like Richard Pryor in Superman III (one the for teenagers) as I tried to make sense of it all. Annoyed with losing those scraps of paper I decided to start typing them up like any self confessed IT geek should. In an attempt to learn more I started to talk to people much more knowledgeable on the subject of training and coaching than I. They recommended further reading, so I did. Not just throw away internet articles on coaching and training plans, but proper books on physiology of the human body, scientific research into the effects of training and all that good stuff. Yes, the sort of books that you pick up and go wowzers, how are these 200 page behemoths relevant to a recreational runner like me? Agreed, most of us are not elite runners but the reality is that the info is totally relevant regardless of your standard. Having read through 7 of these in depth books my online notes became bigger and bigger until eventually I thought what the hell and those notes morphed into what you see today. Hence the subtitle of the document; Doing it by the book(s). So what i’ve tried to do with this document is summarise all that content I read into one shortened place. Whilst the terms the different authors use can be slightly different, the general advice towards training is always the same. The authors sing from the same hymn sheet too, regardless of whether you are an elite athlete or a recreational runner. Okay, the mileage the Elite’s do will be significantly higher, but the concepts are the same. My disclaimer then is that this document is created on a best endeavours basis and that i’m hopefully passing on information that various authors, coaches (experts?) seem to agree on. If this document has sparked an interest in reading further, eBay can be your friend. Most the books listed in the reference section can be picked up pretty cheaply on eBay compared to RRP. You just have to keep looking and occasionally get lucky with a bid or two. What we hope this document can do is explain some of the training concepts and terms alongside some sensible advice and pitfalls to avoid. By putting the basics in place, you can then look to add the elements of training that you find work for you. The document is broken down into seven distinct sections. Be specific, train smart and choose achievable goals. How Much Speed Training to do? Can you tell me exactly what pace to run the Speed Sessions? What is Tempo/Threshold Training and why do we do it? What is Race Pace training and why do we do it? What is VO2 Interval Training and why do we do it? What is Repetition Training and why do we do it? Go Easy, Go Hard, just don’t go in the middle! How long do I stick to the advised training paces? The best way to get better (read faster) at running is to run more, it’s a simple but proven concept. But this doesn’t mean lots of fast running in training, you build endurance using slow and easy runs. Its sounds counter intuitive at times, but this is the way the body works. Run slower to run faster. Once you’ve built a level of endurance you can then add faster speed training. Build the engine, then you can tune and expand the engine. But even after building the engine, you cannot then ignore it, the majority of your training still needs to be at a slow/easy pace. Long runs deliver a slew of physiological benefits: The heart gets stronger because it works harder to boost blood flow to leg, arm, and core muscles. Our ventilatory capacity—the ability to move oxygen in and out of our lungs—increases as we develop our respiratory muscles. Muscle strength and endurance improves because mitochondria (the energy-producing structures in cells) and capillaries (tiny blood vessels that transfer oxygen and waste products into and out of cells) become more dense. Long runs also teach the body to use fat rather than glycogen, or stored sugar, as a fuel source. This saves our limited glycogen reserves for fast running at the end of a long run or marathon. Finally, going long calluses you mentally and gives you confidence in your ability to cover many miles. The number one piece of advice for your long/easy run is keep them easy, think conversational pace. Too many people make the mistake of running their long runs too fast and so not getting maximum benefit. Apologies for repeating this, but just to reiterate: The advice given is that the majority of your training needs to be at your slow/easy pace. Obviously, your easy/slow pace is relative to your own current ability. One person’s slow pace is another person’s fast pace. Thankfully, the document helps in section 2 (Can you tell me exactly what pace to run the Speed Sessions?) by prescribing the correct pace for your ability. Many runners spend months and months doing nothing but slow/easy running to build up their base fitness, usually during periods of the season when there is little racing or they have chosen to take it easy for a while and build endurance. Once they’ve done this they start to add speedwork on top as their target races approaches to sharpen up. But you really need that base level of endurance in place before topping it up with speedwork. Don’t be scared to only run slow/easy for while. The risk of injury is hugely reduced and you know, you might even enjoy just getting out there running, chatting and not worrying about the complicated side of training. With the added benefit that it’s turning you into a more efficient runner. And becoming a more efficient runner equals a faster runner. It’s all win win. Increasing your mileage and workload should be done gradually. If possible, keep some consistency to your weekly mileage and only add further mileage and workload little by little. If you try to go too far or too fast too soon you’ll probably end up injured as your body will start to complain. Running takes patience, one general rule of thumb is to only increase your weekly mileage by 10% per week. This may sound slow going, but if you are running 10 miles per week now, you could be running 20 miles per week in just 8 to 10 weeks. Every few weeks, incorporate a week with lower mileage and rest up a little. This allows the body to take onboard all the hard training, before you go again in the following weeks. You cannot train flat out all the time. If you do you’ll probably end up injured, fatigued, your performance may plateau and you’ll just get annoyed. This is what is known as training in cycles. There are many variations on the recovery periods within cycles; 1 week hard / 1 week easy, 3 weeks with each getting harder then 1 easy depending on what you are training for and where you are in your specific training plan. Listen to your body. If you need a rest, take a rest. You aren’t going to lose much fitness taking a few days off or having a few recovery runs or cross training. Right from the start of your running, record all your runs. Be it with a smartphone and the Strava app or a running watch like a Garmin or Ambit, recording your runs can give you instant feedback on your performance and improvements. A dedicated GPS running watch is the way to go though as you get instant pace feedback and can create lap markers during workouts. See a 7 x 800m session with 60s rest recorded with lap markers in this screenshot. When purchasing a running watch, do consider getting the model with the heart rate monitor. You may not use it straight away, but you may find it useful later down the line. A phone can only record what you’re doing to look at afterwards, whereas a watch can give you live info that you can use during your run. ie seeing your current pace allows you to stick to a predetermined target and being able to create laps and see your current lap pace can really help when doing interval sessions. Similarly, having a heart rate monitor allows you to keep within heart rate ranges depending on the training you are doing. Joining groups on Strava is a great way of seeing what others are upto to give you training ideas and routes. We have our own Striders Strava group which you can join. 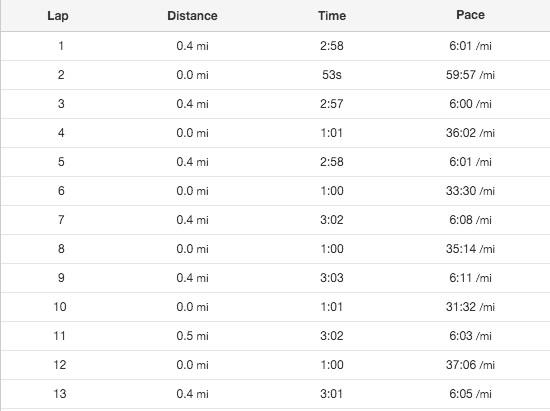 What Strava isn’t good for is getting into a pace race with other people. Train at your pace, not their pace. Strava segment hunting is not the be all and end all of running. We would also suggest keeping an old fashioned training log, maybe on a spreadsheet or similar. Keeping a weekly record of sessions ran; date, session type, distance, mileage, heart rate zones etc. Just a simple summary document you can refer to and analyse. Nothing is more motivating than running with others. If you are the sort of person who struggles to take that first step out of the front door then making the commitment to turn up to a weekly session can really help. Not to mention all the other social and training benefits of running with like minded people. Even if you can’t get to group sessions, see if you can corale a friend into running with you, it makes for a much better experience. If you choose the right group at a training night, a slower group could keep you easy on your easy days. On the flip side, choosing the wrong group to run with could have you running way faster than you intended and turning your slow session something more akin to a race. Don’t expect instant results when you start a training plan. It can take as long as 4 to 6 weeks to start to feel the benefits of aerobic training, so be patient. Which in turns means that as you approach your target race you may want to think about easing up on the training (tapering) as it can take between 2 and 4 weeks to recover from a regime of hard training so that you are fresh and ready for the big day. Usually, the longer the distance of the race, the longer the taper should be and the general advice is to reduce the training load (distance) towards race day but keep the intensity high. Finally, after your goal race you will need to consider a period of recovery. One rule of thumb is one day’s recovery for every one mile raced. So 6 days for 10k, 13 days for Half Marathon and up to 26 days after a Full Marathon before you consider getting back into full training. Treat the days after you’ve raced as recovery days and run them as such, ie very slow. Obviously, these are only guidelines and as with most things with regard running and training, you need to find what works for you as there is no magic one size fits all advice. If you want to get the very best out of yourself you need to be specific about your goals and train correctly for the target race in mind. For example, a targeted training regime for 5k and 10k will be different to that of a marathon. Also, make the goals achievable. We all can’t break word records or win races so make your goals something within reach. You goal may be as simple as finishing a race; you first Marathon for example. Forget times, just aim to finish. PBs and the suchlike can come the next time around. In reference to running, cross-training is when a runner trains by doing another kind of fitness workout such as cycling, swimming, a fitness class or strength training, to supplement their running. It can build strength and flexibility in muscles that running doesn’t utilize. It can also be used as recovery/easy days after races or hard sessions. Swimming for example is a popular recovery session after a hard day as there is no impact involved. Similarly, biking for hours on end can be a fantastic alternative to building your aerobic base. Obviously, as long as you don’t overdo it on those hills. To become the best, most efficient runner you can be, just running isn’t going to be enough. Strength training is one of the single most important non-running aspects of training that can help you become a better (faster) runner. Consider adding exercises like squats, lunges and core work like plank, crunches, twists and bridge to strengthen muscles used in running. Once you can complete these using bodyweight alone, try adding weights into the equation. You may also want to consider the likes of a regular Pilates or Yoga class or just a general stretching and flexibility routine at home to aid your running and prevent injury. Your glutes are the single most important muscle for running, please pay them some strength attention. To help explain more about strength training we have another document on the website that is well worth a read. Head over to Strength, Stability, Exercises and Drills for more strength training specific advice. Any athlete that wants to make the transition from running for fitness to wanting to improve performance usually make the following adjustments. Note: Speed training is for EVERYONE and runners of all abilities can benefit from it, not just the fast guys and girls. We have done this so that we are providing advice for this section of the document from the same constant source. But whilst the terms and wording he uses may be different, the underlying advice is very similar to most well regarded training literature. Jack Daniels splits speed training into 3 distinct terms; Tempo, VO2 Interval and Repetition which can be simply explained alongside Easy running. We can also add into that list Race Pace training. The benefits reaped from each type of running? Note: recommended paces (Easy, Tempo, VO2 and Repetition) are detailed below in the ‘Can you tell me exactly what pace to run the Speed Sessions?’ section. There is no magic formula to how much speed training you do. If you are targeting a race that is months away, you might do 100% of your running at Easy pace then gradually start to add speed sessions as your target race gets closer. As stated at the start, the amount, intensity and duration of your speed training would be dictated by the distance of the race you have in mind. A 5k racer would concentrate more on shorter and faster interval workouts, whereas a half marathoner would benefit from more longer and slower speed sessions like Tempo/Threshold workouts alongside their Easy running. Again, use your specific training plan for guidance, but adding speed training must not come at the expense of or instead of easy running. You still need to do your easy runs and they need to stay ‘easy’. One book in particular that is worth a read is called 80/20 Running:Run Stronger and Race Faster By Training Slower by acclaimed author and trainer Matt Fitzgerald. In this book he presents lots of case studies across various aerobic endurance sports; running, cycling, rowing, swimming, cross country skiing etc and advocates that the recommended ratio of easy to hard training should be 80% easy and 20% hard (ie speed training). This is what is known as a polarized training plan. Obviously, this is open to discussion and each individual’s usage may vary. But he does make a compelling argument. The other books listed in the reference section also allude to a similar ratio. Jack Daniels in his years of working with thousands of athletes has devised a system that allows him to advise runners of their training paces using a most recent race result. In the example table i’ve created below you can see his recommended training paces for runners with recent 10k race times of 60mins, 55, 50, 45 and 40 mins. Alongside those race times (left hand column) are Jack Daniels advised paces (in minutes/per mile) for each of Easy, Tempo, VO2 Interval and Repetition training. And we have also included what Matt Fitzgerald refers to as Easy and Hard. Remember, he suggests your schedule should be just 20% of Hard training (so 20% of your training should be Tempo/Threshold, Race Pace, VO2 Interval and Repetition) with the remaining 80% Easy training. So if you’re a 45 minute 10k runner, Jack Daniels advised pace for tempo runs is 7:25min/mile. As a 40 minute 10k runner you should be running tempo at 6:39 min/mile. As you can then see, there is a big jump in training paces between 45 mins and 40 mins 10k runners. But what if you’re a 42 minutes 10k runner? Fear not, you don’t have to buy the book or guess the pace as we have embedded Jack Daniels calculator into the document, see below. This allows you to put in your most recent race time and it will give you recommended training paces. So you can easily find out that for a 42 minutes 10k runner your tempo/threshold pace should be 6:56 min/mile. Just enter the distance of our race (top left) or choose from a predefined race distance from the drop down box. Then enter your race time (hh:mm:ss) in the centre before hitting ‘calculate’. Finally, choose the training tab to show your recommended training paces. Alternativley, just visit https://runsmartproject.com/calculator/ to use the original website version. If you prefer spreadsheets, Electric Blues website has every last part of Jack Daniels tables and formula in one Excel spreadsheet. Tempo and Threshold training can simply defined as running that is ‘comfortably hard’. What you are aiming for is to produce an elevated yet steady state of blood lactate accumulation. For most runners the pace is equal to a pace they could race at for 50 to 60 minutes. One of the limiting factors of running faster when racing is the onset of lactate accumulation. Running at your tempo/threshold pace in training and invoking a steady accumulation of blood lactate stresses the body and subsequently encourages the body to get used to this level and improve performance with prolonged training. In essence by running at tempo/threshold pace you are training the body to get used to lactate accumulation and pushing your threshold upwards. You can undertake tempo/threshold training in a variety of different ways. But be mindful that you don’t want the breaks too long during intervals otherwise it will take too long to get back up to threshold pace and you don’t want the work bouts too short so that you don’t get the benefit. For beginners, start at 20 mins or three x 1 mile intervals and build yourself up. With tempo/threshold, there is no need to go faster than the advised pace. The aim is to stress your lactate clearance capability, not overstress that capability. Remember, it’s comfortably hard and no more. This is where having a GPS really helps as it can show your current live pace and you can adjust as required throughout the workout. Note: Fartlek is Swedish for speed play, Fart being Speed, Lek being Play. Swedish coach Gösta Holmér developed fartlek in 1937 as a training regime for his hugely successful Cross Country skiing. Fartlek training “is simply defined as periods of fast running intermixed with periods of slower running”. If you don’t train at Race Pace how will you know what it feels like come race day? Sustained runs that are up to around 75% of total running duration for a race, at race pace are superb for conditioning the body to the demands of racing that distance. So getting you used to the pace and fatigue that running at that pace. Early on in your programme you could start with say 1 mile easy, 3 miles HM pace and 1 mile easy. Similarly for 10k with 1 mile easy, 2 miles 10k pace and 1 mile easy. Through your programme you would start to gradually increase the time spent at race pace. You could use straight mile after mile or you could use mile or time reps with recoveries. Upto a maximum of 1 mile easy, 10 miles at HM pace, 1 mile easy for example. With 10k race pace you could build up to running 1 mile easy, 6 x 1 mile at race pace with 1 minute recovery and then 1 mile easy. How you create your session with efforts and recoveries combinations is entirely upto you and over time you will find what works best for you. These are great sessions for speed endurance, that is the ability to keep running at a given pace for the duration. The key to these hard sessions is being fresh. So ensure a recovery day both the day before and the day after. You can use less important races in your plan in the run up towards your goal race, These are very good indicators to see where you are in your training without the pressure being your goal race. Note: These sessions are not an alternative to your long slow easy runs, they are as well as. Race Pace sessions should be classed as hard in the 80/20, easy/hard split. Jack Daniels uses the term ‘VO2 interval training’ to mean VO2 max interval training. VO2 max? VO2 max is the maximum amount of oxygen your body can use during exercise. It is a combination of how much oxygen your lungs can take in, convert into the bloodstream, which is then pumped throughout your body by your heart and finally how efficient your muscles are in consuming and converting that oxygen for use. Since oxygen is the most critical component to running a fast pace, your VO2 max is the best measure of your running fitness. As you begin running your VO2 rate will increase and continue to increase until a point it can increase no more. This plateau of where you can no longer utilize oxygen any faster is your VO2 max. The higher your VO2 max, the better your fitness level. So to improve your VO2 max, just like your lactate threshold you need to stress that capability to invoke positive changes. The idea of an interval session is to accumulate a good bit of time working at 95 to 100 percent VO2 max. When running at proper interval pace, your body takes about 2 minutes to reach the point where it’s operating at maximum oxygen consumption (ie, the purpose of this workout). If you run 4 x 5 minute runs at this pace, and its takes 2 minutes to reach max in each run, then of your 20 minutes of hard running you’ve accumulated 12 minutes (4 x 3) of running at VO2 max. On the other hand if you run 20 x 1 minute runs at the same hard interval pace, and recover fully between each of the runs then you would accumulate zero time at VO2 max. Why? Because it takes 2 minutes to reach max, and running hard for only 1 minute at a time won’t allow that. So running for only 1 minute at a time you must reduce your recovery time so that you’re not yet fully recovered before starting the next run. So reps of between 3 minutes and 5 minutes are ideal. VO2 Interval training is usually completed at the running track as it provides a constant distance and flat training area so you can keep the pace constant. So for 2 minute plus reps, think 600m and longer. For 400m and shorter, refer to ‘repetition training’. Obviously, you don’t have to complete VO2 interval training on a track, any flat and consistent terrain should suffice. As with threshold training, there is no need to run any faster than the prescribed VO2 interval training pace. Ideally you want to complete the whole session at the same VO2 max invoking pace. Going out too fast will stress the body too much and limit your ability to complete all the intervals at the correct pace. Repetition running is very fast running. The benefits of Repetition training are associated more with the mechanics and anaerobic metabolism than with the aerobic factors of the other training types. The intensity of running reps usually puts considerable stress on the body to provide energy anaerobically, which in turn produces beneficial changes in anaerobic pathways, where fuel is converted to energy in the absence of adequate oxygen. Also, by practising at repetition pace you learn to run more relaxed and faster, and race pace becomes more familiar and comfortable. In repetition training, you recruit the exact muscle fibres that you need for more economical running. These are the muscle cells that allow you to run fast with minimal energy spent. Repetition workouts involve running at faster speeds, often at race pace or faster, while making sure that each work bout is done with proper technique and adequate recovery. So Repetition training is relatively short (but fast) work bouts with enough recovery time to allow each subsequent run to be just as efficient as the first run of the series. Recovery time is key as the purpose of the reps is to improve speed and economy, and the best way (almost the only way) to run fast and with good technique for repeated work bouts is to be fully recovered from the previous run before starting the next. Repetition work bouts usually take less than 2 minutes. If they are longer than this, then they would be better done as ‘Interval’ training and lower the pace accordingly. Again, there is no need to run any faster than the prescribed Repetition pace, but remember to be fully recovered between intervals. Hill training is an alternative type of Repetition training. In fact, when you analyze what you’re doing during a hill session and during a Repetition session, they’re quite similar. You’re typically working at a rather high intensity for a relatively short period, followed by a recovery break that’s longer than the work bout that it follows. (returning downhill) Uphill running is also good for strengthening areas of the hips and legs, which leads to improved running economy and power. Be careful to take it easy on the downhill part of the workout as it can be quite stressful and demanding on your legs. Quite simple really, make sure you stick to easy pace/easy HR on your easy and recovery days. Don’t get tempted to turn an easy run into a middle of the road semi hard run. As we keep repeating, the benefits of the long slow run really come it truly is slow and easy. And at the other end of the scale, hard workouts are meant to be hard. This is your polarized training plan. You’re either running easy or you’re running hard. Those middle of the road runs that are neither easy or hard don’t improve you in the same way a polarized plan can. The weekly speed sessions at Millhouses are an ideal introduction to bringing speedwork into your training regime. The sessions take place on the roads around and close to Millhouses Park, so just using the terrain we have to hand. Each week the schedule changes so that different speedwork elements are covered. The Pyramid session of 10 x 300m could be used Repetition training, whereas the 5 x 800m is a great VO2 max session. There are also hill sessions, fartlek and other combinations of interval sessions. The weekly speed sessions in Hillsborough are an ideal introduction to bringing speedwork into your schedule and they also have an element of strength and conditioning with different drills each week before the main set. The sessions take place on the roads around and in Hillsborough Park, so just using the terrain we have to hand. The hill and interval sessions are great VO2 training and there are also faster repetition style sessions. As stated earlier in the document, the track is the best place to run Repetition and VO2 Max intervals. Similar to the Tuesday night Millhouses schedule, the Thursday track night has pre planned sessions. Be sure to read Peter Brown’s excellent Track Introduction guide. As the track is a fixed 400m, the sessions are more formal than using the roads around Millhouses which then gives you more accurate distance and timings. It is recommended that you stick to the training paces for a consistent block of training and recovery weeks for around 6 weeks, after which you should have adapted to the training stress and realized the benefits. You would hope that the speed sessions have become slightly easier on week 6 than they were on week 1. It’s recommend to stick with it for 6 weeks because the primary danger of increasing training too quickly is an escalated risk and overstress caused by taking on too much too fast. On the flip side, sticking to a training plan based on the same mileage, speed and intensity will see benefits for the first 6 weeks and whilst you may continue to see improvement for further weeks, you would see more improvement with an increased training stress and starting another 6 week block of training. If there is a race at the end of the 6 week period and the result of the race changes your training paces, go ahead and change accordingly. If there is no race at the end of the 6 weeks and you feel like you are progressing, then you could increase the training paces by between 5 and 10 seconds to make them faster. The other options you have are to up your weekly mileage or the increase the intensity of your training. To continuously improve you need to keep stressing your body by making positive changes, so by going either faster, longer or harder. The simplest way, if you’re happy with the content and duration of your training plan is to increase the pace of your workouts. But don’t forget those recovery weeks, they are just as important as the workouts. If you’ve searched on the internet for heart rate advice, you’ve probably seen 220-age to determine your maximum heart rate. Well forget it, it’s notoriously inaccurate as maximum heart rate and heart rate patterns in general are totally unique to each individual. They are also dependant on fitness and other factors, so please forget 220-age. Finding your maximum heart rate can be done by a ‘max heart rate’ workout. In its most basic form; run until you drop. Google ‘maximum heart rate test running’ to see what you have to endure. Even then, it’s not wholly accurate, so probably best avoided. If pushed, and we had to recommend a website to help create heart rate zones, then we’d say Brian Mac’s website and calculator. You can get started by using just your age and resting heart rate. Record your resting heart rate as soon as you wake up in the morning and do this for a few days to get a consistent view. But in all reality, even the Brian Mac site and calculator is guess work and unless you are lucky, probably inaccurate. So the only reliable way to work out your zones etc is to take a blood lactate threshold test. But these aren’t cheap, coming in anywhere between £80 and £100. But they are growing in popularity and are readily available at various local physios and running stores. The blood lactate test is undertaken on a treadmill and has you initially running slowly and a pin prick of blood taken at regular intervals as the treadmill pace increases. The aim of taking blood at these intervals is to find the point where lactate accumulation in the blood reaches 2 mmol/L (ventilatory threshold) and 4 mmol/L (your lactate threshold). Once you know the pace and heart rate at where these both occur you can then use these to work out the rest of your zones and training paces/heart rates. Complicated? Over the top for a recreational runner? Probably. But before you launch that heart rate strap in the drawer forever, there is a very good use for it. Sheffield is hilly! (Tell us something that we don’t know!) So being hilly means it’s difficult to stick to training paces. Just try sticking to 9:00 min/mile when undertaking a run on an undulating route. But we can use heart rate instead. First off, you have to complete a few benchmark runs on as flat a route as you can find. Start off by warming up and running for 10 minutes to get things moving and your heart rate stabilized. Then, run at the slow end of your recommended Easy pace (from the Jack Daniels calculator) for one mile sticking to that pace as closely as possible. After the mile, speed up to the top end of your Easy pace and run for another mile. For the third mile speed upto your recommended Tempo pace before finally dropping back down to your Easy pace for a cool down mile. When you get back home and upload your run to Garmin/Strava or whatever software you use, you will see the average heart rates for paced miles; mile one, mile two and mile three. These can now be your Easy heart rate range (mile one and mile two) and your Tempo heart rate (mile three). Running to heart rate rather than pace means that you don’t have to worry about hills affecting pace. Just stick to Heart Rate instead. This only works for Easy and Tempo paces though as VO2 Intervals and Repetitions are run too fast and usually too short to accurately map a heart rate to, so stick to recommended pace for those. The final recommendation with regard heart rate training is to take a look at the the Maffetone Method and his 180 formula. Earlier we suggested to disregard heart rate formulas, but please do look at the Maffetone 180 Formula as its not aimed to work out your maximum heart rate, rather your easy pace heart rate. We’ve detailed his simple system here. To find your maximum aerobic training heart rate, there are two important steps. a) If you have or are recovering from a major illness (heart disease, any operation or hospital stay, etc.) or are on any regular medication, subtract an additional 10.
b) If you are injured, have regressed in training or competition, get more than two colds or bouts of flu per year, have allergies or asthma, or if you have been inconsistent or are just getting back into training, subtract an additional 5.
d) If you have been training for more than two years without any of the problems listed above, and have made progress in competition without injury, add 5. For example, if you are 30 years old and fit into category (b), you get the following: 180–30=150. Then 150–5=145 beats per minute (bpm). In this example, 145 must be the highest heart rate for all training. This allows you to most efficiently build an aerobic base. Training above this heart rate rapidly incorporates anaerobic function, exemplified by a shift to burning more sugar and less fat for fuel. What you should hopefully find is that the suggested heart rate from the Maffetone 180 Formula should correspond nicely to the heart rate range you derived from Easy benchmark run as suggested earlier. As with all training methods, it may work for you, it may not. That is something you just have to find out by experimenting with all the training recommendations in this document. 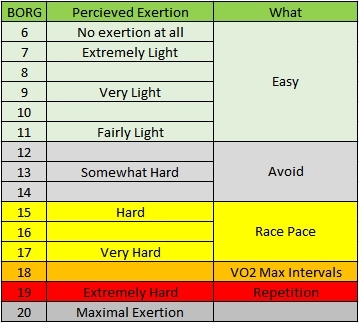 One way to gauge how hard you are exercising is to use the Borg Scale of Perceived Exertion. 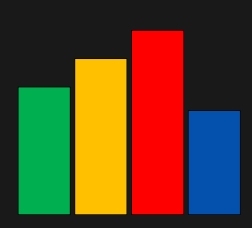 Created in 1982 by Dr.Gunnar Borg, the Borg Scale takes into account your fitness level: It matches how hard you feel you are working with numbers from 6 to 20; thus, it is a “relative” scale. The scale starts with “no feeling of exertion,” which rates a 6, and ends with “maximal exertion,” which rates a 20. 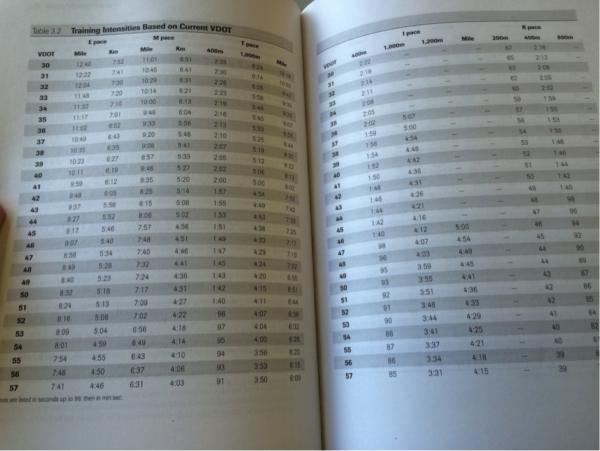 You can use the table of perceived effort to ensure you are training in the correct area. ie Easy or Hard. When building a plan we need to consider the target race, current fitness/readiness and the number of weeks we have before that target. Each week through the plan will look to cover some or all the following components. The amount of time spent on each component changes through each phase as we move towards the target race and can depend on the target race. But it will always be around 80% Easy and 20% Hard. Another concept we’ll use is Macrocycles, which means that we’ll break the phases listed above down into 4 week blocks and increasing adjust training loads through those 4 weeks. Building up to an overload in week 3 and then recovery in week 4 as per the graph. As you can see in this example we have stuck to the 10% rule which suggests adding no more than 10% new load each week. The most important week in those 4 weeks is the recovery week. This is week where your body takes on board all the stress and recovers ready for week 5. The extra load each week could be extra miles, extra speed, extra reps. Anything that creates stress and overload, which with recovery week creating adaptations that allow you to push yourself that little bit further in the next Macrocycle. But be careful not to increase more than one element at a time. 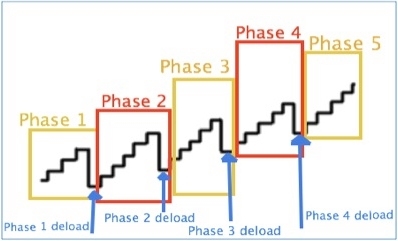 Hopefully this next diagram explains the concept a little showing multiple 4 week periods of increasing load and how each week gradually increases the training volume in a stepped manner. Then once your short racing stage is over you then enter recovery. Seriously, pack running in for a few weeks. Swim, cycle, find something else to do. Enjoy the break. You can then plan the next big race and start the whole cycle again. Don’t worry about losing fitness, you won’t lose that much and you’ll be raring to go when training starts again. Whilst the underlying message of the document is to sprinkle varying amounts of Easy, Tempo, Race, VO2 and Repetition sessions in your balanced training plan, the amount of you do of each type of training depends on two things. The distance of your target event. Point 2 relates to the fact that a runner wanting to become the very best 5k runner he or she can be will have a different training regime to if they wanted to target a full marathon. This is because the body needs to work in different ways come race day, so you train your body ready for the demands of your target race. And as discussed in section 6, the training will become more specific and race like as you progress through your plan towards your target. To explain the concept in numbers acclaimed coach Pete Pfitzinger created these simple charts. As you can see from the charts, there are two subtle changes throughout. A shift towards more race specific training as you progress through your plans, with Base/Easy always the first element and cornerstone of every plan. You should also take specificity to the nth degree. Nutrition, clothing, footwear, breakfast etc. Practice not just the race element, but all the parts that will make up your day. Don’t leave it to the morning of your big race to try that new jazzy breakfast recipe you read in a magazine. Firstly, build an aerobic base and your endurance by doing nothing but slow and easy running. A subsequent balanced training plan would have you regularly cover all these elements. The balance between easy and hard is dependent on the individual and the target race, but normal convention suggests the majority of your training needs to be easy in nature and as high as 80/20 easy/hard. Don’t run the same distances, routes and same sessions every week. Alter the distance or interval time and recovery. Keep the body guessing. Be specific and train smart. If you’re after a 10k PB, train like a 10k runner. Ensure your easy days are at an easy pace. Don’t get carried away and run faster. You can use the included pace calculator to give suggested training paces for all your training. You don’t have to run exactly to these paces, that would be very difficult to consistently achieve, so running 5 to 10 seconds (min/mile) either way will be fine. Be consistent with your weekly mileage and load. Don’t overdo it, even if you feel in tip top shape, stick to your regular mileage and sessions. Take appropriate rest and recovery. Don’t disregard strength, stretching and flexibility training. Your glutes are the single most important muscle for running, train them. Experiment with different training, some workouts may suit you better than others. Steadily increase the training load (faster, longer or more intensity). Use heart rate for Easy and Tempo runs to mitigate for hilly Sheffield. Enjoy your running, don’t let it get you down. Its meant to be fun.